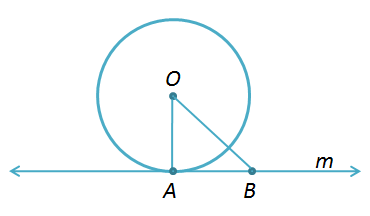 In this post, we discuss a theorem on tangent of circles. We show that if a line is perpendicular to a radius of a circle at a point on the circle, then the line is tangent to the circle. In the figure below, line m is perpendicular to at . We show that it is a tangent to circle O. If a line is perpendicular to a radius of a circle at a point on the circle, then the line is tangent to the circle. Line is perpendicular to at . Let be another point on line other than . Since is perpendicular , triangle is a right triangle with hypotenuse . This means that and must be on the exterior of the circle. Therefore cannot lie on the circle and is the only point of m that is on the circle. So, is a tangent to the circle. The converse of this statement is also true (see proof).